Though cruelly stereotyped as a one-dimensional caricature, there are many sides to Guy Fieri. Like all humans, his is a complex persona composed of multiple facets, some of which are not immediately apparent to casual fans—which is to say, there are more Guys than meet the eyes. Sure, most of us know him as a food Guy. But he’s also a wine Guy, an open-minded Guy, and on a personal note, he’s my kind of Guy. Perhaps most importantly, though, he’s a car Guy. Now I already knew that Fieri was a car Guy, ever since he waxed poetic about the vintage Camaro that he uses to commute to and from Flavortown for his job, hosting Diners, Drive-Ins and Dives. But apparently, his connection to the automotive world predates his Triple-D fame. Uh-oh… that’s not the Guy I know. He’s saying some very Guy-esque words in this video: “extreme,” “maximum,” “American” (he even says that last one twice). But his delivery is too serious and deadpan, lacking the levity and enthusiasm that he brings to his reviews of deep-fried foie gras poutine. And the look is all wrong, too. Why is he hiding his trademarked spikes under a baseball cap? Why is he wearing a gray t-shirt instead of a flame-covered bowling shirt, and why is that t-shirt tucked into his pants, and why are those pants jeans and not knee-length cargo shorts? Here he’s talking about a subject that should be right in his wheelhouse (MUSCLE CARS!!! ), but again, he just sounds like your average pitchman, when he should be sounding like a pitchGuy. Where’s the imaginative language and wide-eyed hyperbole? Where are the radical catchphrases that we fans know and love? Like, are these aftermarket car parts connected to a chain of some sort? Because Guy isn’t describing them as “off the chain,” and if they were, I’m quite sure that he would delight in telling me that! And for the love of God, why isn’t he biting into that exhaust pipe and then making vaguely sexual moaning noises while he chews it?!?! 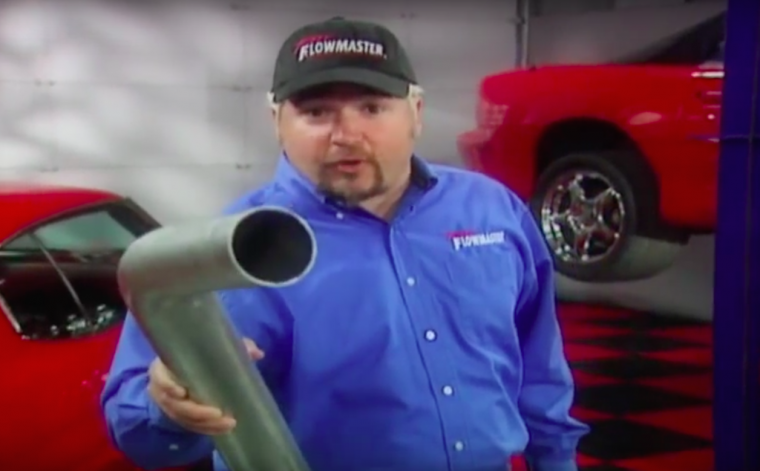 Thank goodness that this Flowmaster Guy seems to be long gone. I don’t like this Guy. I like the Guy I know.